Spice and K2 refer to synthetic marijuana. They are sold in convenience stores and over the Internet. Effects of these drugs include a feeling of relaxation, elevated mood and altered perceptions. Side effects of Spice and K2 can include visual and auditory hallucinations, paranoia, seizures, severe headaches and chest pain. The drugs are addictive and can include withdrawal symptoms such as irritability, decreased appetite, muscle pain and social withdrawal. Spice and K2 are popular among teenagers, who see them as a safe alternative to marijuana. Who Answers? to get information about rehab and recovery options for Spice or K2. Where Did Spice and K2 Come From? Spice and K2 had no age-buying restrictions until recently. Spice and K2 appeared on the market in the early 2000s and grew rapidly in popularity. Because there were no age-buying restrictions on synthetic cannabinoids until recently, their use became widespread. Many people used Spice and K2 to achieve a high while avoiding legal consequences. They became popular among young people and those on parole. Many people do not recognize the high degree of risk with these drugs given that they are so readily available both in convenience stores as well as on the Internet. Outpatient: These programs work best for people who have a mild addiction and can’t afford to take time away from work or home responsibilities. They can vary in intensity but typically meet 2-3 days a week at the treatment center for a few hours. 12-step programs: Twelve-step programs do not cost anything but do not provide the level of care of an inpatient or outpatient program. You meet with other drug or alcohol users in recovery and find a sponsor who guides you through a series of 12 recovery steps. Marijuana Anonymous or Narcotics Anonymous are programs that may help someone recovering from Spice or K2 addiction. Inpatient or residential: Inpatient rehab centers provide an environment free of distractions where you have regular access to medical and addiction treatment professionals. Before you begin a Spice or K2 recovery program, learn more about how Spice or K2 addiction is treated and what to look for in a rehabilitation center. Not all rehab programs are the same. You can save yourself or your loved one time and money by checking out a few treatment centers beforehand and thinking about what kind of treatment works best for you. Type of program (inpatient vs. outpatient). With insurance: Call 1-888-319-2606 Who Answers? to verify what your insurance will cover and learn more about your treatment options. Without insurance: Call the Substance Abuse and Mental Health Services Administration’s toll-free helpline for more on finding a rehab center without insurance. People commonly smoke Spice and K2. In some cases, people will mix Spice with marijuana or will make an herbal-infused tea from the drug to drink. The drugs’ action on the cannabinoid receptors within the brain is thought to be the primary source for the psychotropic effects of taking the drugs. Spice and K2 users report that the drugs have very similar effects to that of marijuana. Overall sense of being relaxed. Failure to meet responsibilities at work or school. Persistent mental health issues (such as anxiety, paranoia, agitation and hallucinations). Cognitive deficits (such as impaired learning, difficulties with problem-solving, short-term and long-term memory problems). Who Answers? if you or someone you love has a problem with Spice and K2 abuse. Many people hold the same belief about Spice and K2 as they do about marijuana: that they are not addictive. But people who abuse them can develop the classic signs of substance dependency, including a growing tolerance to the effect of the drug as well as a withdrawal syndrome when the drug isn’t used. Intense cravings for Spice and K2. The use of these synthetic substances has proven to be dangerous, with unpredictable effects and habit-forming potential.4,5 Perhaps the largest risk with using Spice and K2 is that the drugs may contain many unidentified and possibly toxic additives, as the drugs’ manufacturing is not regulated. In 2010, an estimated 11,406 emergency department visits were caused by the use of a synthetic marijuana product. Overdose can occur with Spice and K2. If you or someone you know may be suffering from spice overdose, call 911 immediately or visit the local emergency room. The use of Spice and K2 is quite common among adolescents and young adults. In fact, some estimates have suggested that Spice use is second to marijuana use among high school seniors.4 Ease of access and the false belief that these drugs are a safe alternative to marijuana account for their high popularity among teens. According to the 2014 Monitoring the Future Study, a yearly survey of teenage drug abuse, more than 5% of high school seniors reported using Spice within the last year. If you or someone you love is struggling with Spice or K2 abuse, call 1-888-319-2606 Who Answers? to speak with a treatment support specialist about rehabilitation centers that can address your recovery needs.
. Mills B, Yepes A, Nugent K. Synthetic Cannabinoids. Am J Med Sci 2015;350:59-62.
. Salani DA, Zdanowicz MM. 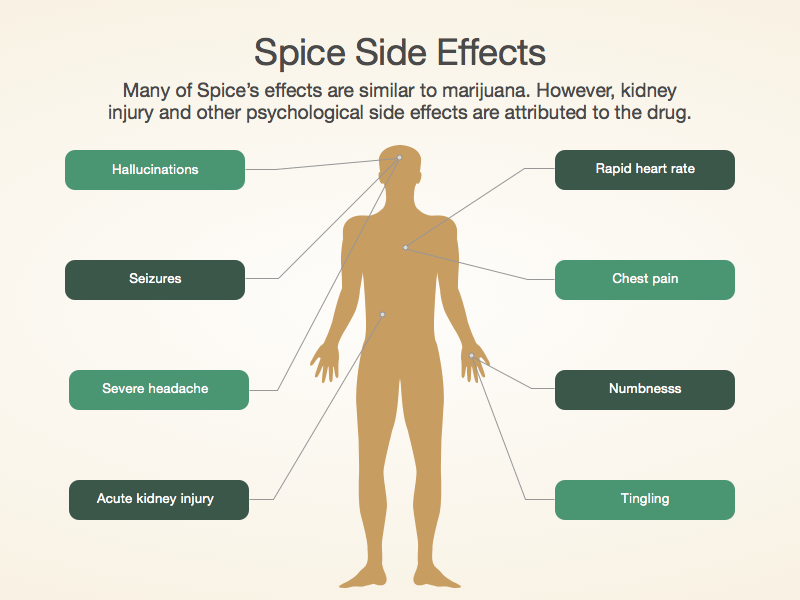 Synthetic cannabinoids: The dangers of spicing it up. J Psychosoc Nurs Ment Health Serv 2015;53:36-43.
. van Amsterdam J, Brunt T, van den Brink W. The adverse health effects of synthetic cannabinoids with emphasis on psychosis-like effects. J Psychopharmacol 2015;29(3):254-263.
. Ware MA, St Arnaud-Trempe E. The abuse potential of the synthetic cannabinoid nabilone. Addiction 2010;105(3):494-503.
. Brewer TL, Collins M. A review of clinical manifestations in adolescent and young adults after use of synthetic cannabinoids. J Spec Pediatr Nurs 2014;19(2):119-126.
. Morgan CJ, Curran HV. Effects of cannabidiol on schizophrenia-like symptoms in people who use cannabis. Br J Psychiatry 2008;192(4):306-307.